During the long, rich period of doll production in the Thuringia region of Germany, there were probably several hundred firms that specialized in dollmaking. The Thuringia region had rich clay deposits which dollmakers used to make porcelain. In fact, the region already had a rich tradition in glass-making as early as the 12th Century. Additionally, over the years, many families in the region became skilled in crafting and dollmaking and so the region became the depository of a wealth of porcelain dollmaking knowledge. The dolls produced in this region were some of the very best ever produced in the world. This makes it hard to pick a top five list of German antique doll brands. These firms have names (and dolls) that resonate best and most familiarly with collectors. Also, please note that this list is limited to bisque (commonly called porcelain) dollmaking companies from approximately 1860 to 1930. Also note that there are many, many beautiful dolls from this region and period that are not only not from these firms, but also which can often be unmarked. A trained eye is always the best way to choose antique dolls. Kestner is often called the King of Dollmakers, and for good reason. One of the longest surviving dollmaking companies in Germany, Kestner actively produced dolls from approximately the 1920s through the 1930s — over a century of quality doll production! In the beginning, Kestner produced wood and papier-mache dolls; then they made China (porcelain) dolls, and finally bisque dolls (commonly called porcelain today). They are best-known for their bisque dolls which ran the gamut from early turned-shoulder head (stationary neck) dolls with kid bodies, to dolly-faced dolls with fully jointed composition bodies, to lady dolls, to all-bisques to character dolls. Collectors love Kestner dolls, not only for their quality but for the wide variety of dolls available as well. Some of the best known antique dolls made in Germany were made by Armand Marseille. In some ways, Armand Marseille was the Mattel of the German doll market, and the ubiquitous 390 dolly-faced bisque doll was the Barbie Doll. The most common German bisque doll to find is by far the Armand Marseille 390 and 370. At the height of their production, they were producing over 1,000 bisque doll heads a day. That may not sound like much to us today, but at the time, that was quite a feat especially since there really wasn’t any part of the production of bisque doll heads that was automated. Although Armand Marseille is best-known for their bisque doll head production, during their existence from 1885 through the early 1930s, they did produce other types of dolls. They produced character baby and toddler dolls, lady and flapper dolls, and their much rarer and today highly sought after series of character children. Compared to Kestner and Simon and Halbig, Kammer & Reinhardt was a bit of a latecomer to the German dollmaking scene. However, their dolls were also beautifully made. Best known for their dolly-faced bisque dolls and character dolls, Kammer & Reinhardt was a large customer for the Simon & Halbig bisque doll heads — you will often see doll heads from the period marked with both the Simon and Halbig and Kammer and Reinhardt marks on the head. In fact, Simon and Halbig combined with Kammer & Reinhardt in the 1920s towards the end of the production of bisque antique dolls. Kammer & Reinhardt was a forerunner and perhaps best-known for their creation of character dolls— dolls that looked much more like real children as opposed to the more idealized doll faces of the dolly-faced dolls. A good example of this can be seen in the Kaiser Baby. This company was founded in 1839 and produced bisque head dolls from their two factories based in Thuringen from 1869 until 1932. They supplied doll heads to many other doll makers. They were bought by Kämmer & Reinhardt in 1920. Although a true latecomer to the dollmaking scene in Germany, Heubach produced many distinctive dolls. Nearly every doll from this company could be considered a character doll — Heubach was not known for dolly-faced dolls. 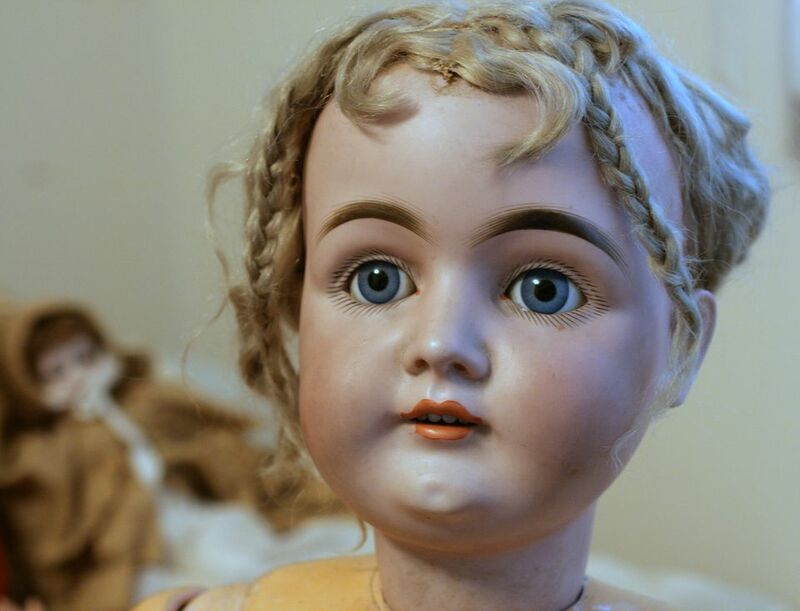 The bulk of their production was from 1910 through the 1920s, and although it might be difficult to attribute the dolly-faced dolls of the above four companies to their manufacturer by looks alone, most collectors can identify a Heubach by sight. They had many pouty children, and most of their dolls sported closed mouths. Additionally, Heubach dolls tend to be smaller than the dolls of the other four companies; the vast majority are under 20” tall.